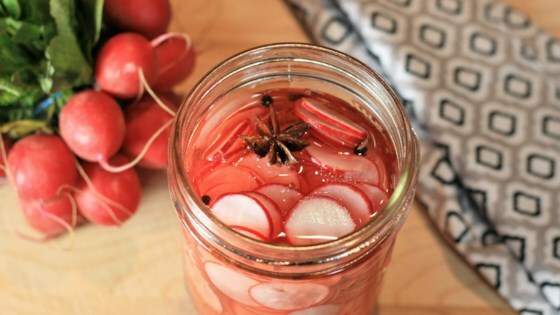 "Pickled radishes add a nice flavor to so many things, including salads, noodle bowls, tacos, and brisket sandwiches. They're even great on their own! They're easily customizable with different spices and seasonings. These are ready in minutes, but the flavor only gets better overnight. They will turn a lovely shade of pink the longer they sit. Use a mandoline slicer for quick, even slicing. Will keep for several weeks." Place radish slices into a pint-sized jar with a lid. Heat vinegar and water in a small non-reactive saucepan over medium heat; whisk in sugar and salt until just dissolved. Remove from heat and add star anise pod, cumin seed, and black peppercorns. Let cool slightly for 5 to 10 minutes. Pour liquid over radishes. Cover and let cool to room temperature, then refrigerate. Watch Chef John make quick-and-easy pickled peppers. Only thing I couldn’t find anise pods so I used anise seeds. I gave 5 stars for ease and flavor. Love this recipe! I made it this past weekend. Took no time at all and are delicious. Will make year round as I adore any type of radish. Thanks for sharing. Delicious. It stays crispy, perfect to add some tanginess and crunchiness to a sandwich. Refreshing as well.